Fifteen years ago, I went to what I considered the most Christian wedding I ever experienced. From the beginning to the end of the ceremony, it honestly felt as if it was a church service. After that, I always wanted to fashion my wedding after it. 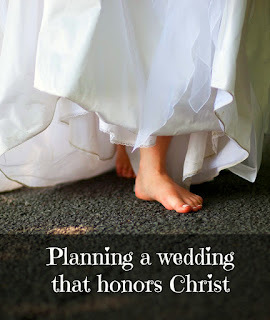 When I was newly engaged, I got advice from lots of people as to what I should do, what books, planners, etc., were most helpful, but believe it or not, the one I used the most was A Christ Centered Wedding. This book included everything I had hoped to find in a Christian wedding planning book, and also gave my husband to be and I some great discussions as to what we hoped to accomplish at the wedding and reception -- and some things we wanted to leave out -- such as alcohol and dancing -- and how to handle that with people who put those expectations on our wedding. 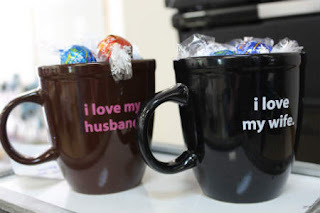 We didn't use the same gift for everyone who participated in our wedding. For one of my bridesmaids, she received an Amazing Woman Coffee Mug with Coaster. Our "ring bearer" received a gift of his very first Bible. 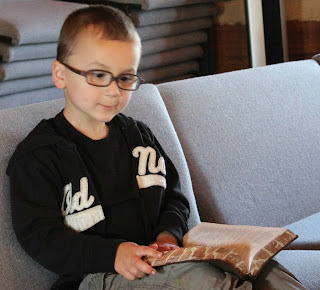 I chose The Adventure Bible for him. He said upon receiving it, "I could read this every day." (Reports are he rose the morning of the wedding proudly carrying his new Bible and smiling that he owned his own Bible.) For the friend who walked me down the aisle, I gifted him with a a subscription to an online Christian streaming service. When he saw what I gave him, he was all excited saying how great it will be for when they move back overseas. For music, I purchased both 50 Wedding Hymns and Songs and the accompaniment CD to Twila Paris' song How Beautiful. While our soloist decided to not use the CD, he had never heard the song before, and he was able to learn to play it on the guitar. I entered at the verse "How beautiful the radiant bride". The song gives a lovely imagery as to how marriage is a small picture of Christ and His Church. I am allergic to flowers. This also helped our budget. I carried the Bible my mother carried down the aisle at her wedding. It was a family heirloom anyway, and even more special now. We didn't really trust a four year old with rings, so our "ring bearer" carried my Dad's Bible down the aisle. 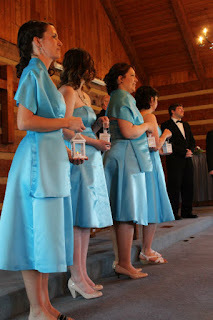 If you don't have a special family Bible for this purpose and would like to create an instant heirloom, this Bridal Bible is a great choice.. My bridesmaids carried lanterns. I even was able to find some with a cross on the side. 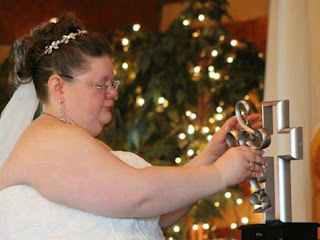 Instead of the traditional Unity Candle, we chose instead to assemble a Unity Cross. So many people commented on this. The outer part was put in by my husband, as it represents the strength of the husband's role. The inner cross was put in by me because it represents how a lady makes a house a home. 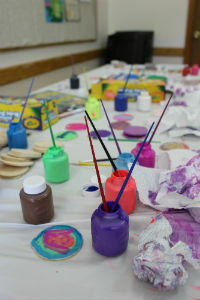 The three pegs that hold it together are representative of the Father, the Son, and The Holy Spirit. We had so many compliments on this, and we now have a nice piece of art from our wedding day to treasure. One of the things we wanted to celebrate at our reception was marriage. 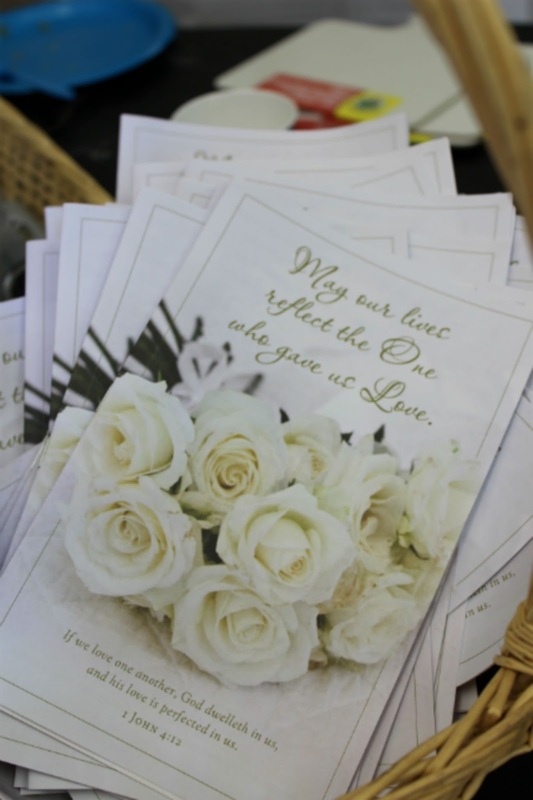 The Christ-Centered Wedding book gave us several ideas. We asked our emcee to have everyone who was married raise their hands. Then those married under five years were to lower their hands, and so on. It was amazing to see how many people were at our wedding who were married over twenty-five years. It was a great encouragement to me! When it got to those who had been married fifty years, there were two couples that the emcee interviewed, and each person of those couples gave a bit of marriage advice, and the couple who had been married fifty-six years took home a gift of candy filled mugs for the Mr. and Mrs. that honor marriage. It made it even nicer that the two couples married the longest are very special to me, and it was great to make them a part of our day. 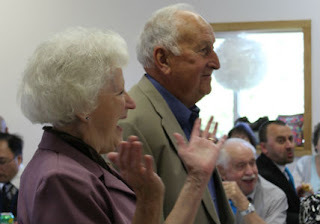 The longest married couple receiving their gift. Another thing we decided to do was forgo the traditional bouquet and garter toss. (I mean, a garter is basically underwear, and that's not something I felt comfortable doing to begin with.) While talking about what we wanted to do, we decided to go ahead and split men and women into groups, but not beyond that. As a first time bride in my 40s, I didn't want anyone to feel awkward about being pushed into the crowd of single people. I wanted to make things easier for my divorced friends because they are never sure if they should join in these tosses or not. So every person was eligible to catch -- get this -- a container with a gift card in it. It was a huge hit. These are just a few of the things we did to help weave our faith into our wedding day. There are many, many ways that it can be done, but these were a few of my favorites. 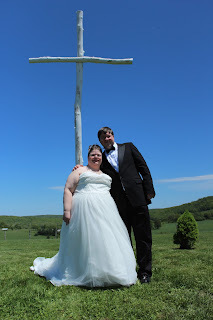 One of the things I enjoyed most about the day is we planned a wedding that was a little different than usual, but was Christ-honoring, and an absolutely beautiful ceremony. As someone who officiates weddings I LOVE how much effort and thought you put into making your wedding something that honored the Lord, and honored your attendants & guests. Great job loving Him and them at the same time - oh, and congratulations!!! Thanks, James! 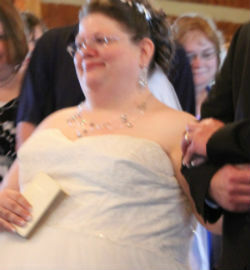 I have a number of posts about my wedding. We really wanted everyone to feel comfortable and be welcomed. Instead of dancing we had a Christian illusionist and people are still talking about how much they enjoyed the show he did. :) We got married in the church I grew up in as well, and that made it extra special, too. This is awesome. I love how people can share God's word at both weddings and funerals. Sometimes that's the only way people hear the news. What a wonderful look into making a wedding that honors Christ. I love all of your ideas and only wish I had thought about some of them 10 1/2 years ago. Thank you so much for sharing this over at Throwback Thursday Blog-Style. I just wanted to let you know that your post was selected as the featured post this week. I hope you will be able to join in again with Throwback Thursday. I am looking forward to visiting your blog again. Blessings.